Well, it’s now a month in as of yesterday, and I can definitely say the novelty has worn off – and, somewhat to my surprise, I’m still wearing it every day. Perhaps it’s time to drop the ‘skeptic’ part of the title. My main additional complaint is what might almost be described as click-bait notifications: notifications that let you know something is going on, but don’t actually tell you what. To find out, you have to pull your phone out of your pocket. Facebook Messenger is a classic example. 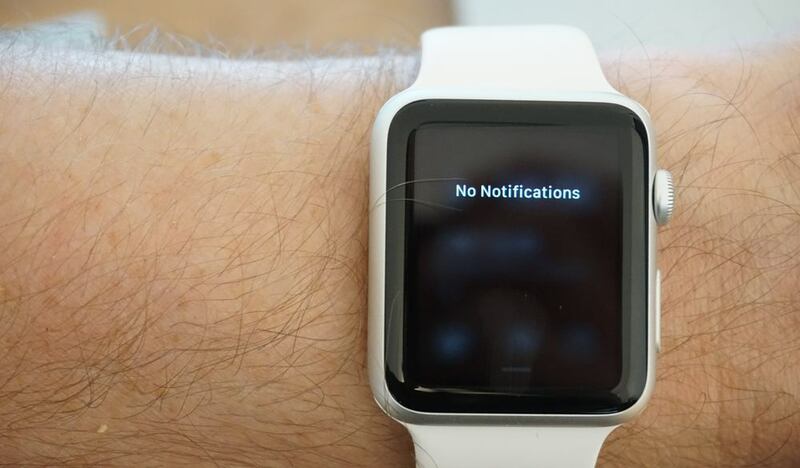 When someone sends you a message, the Watch notification shows you who has sent the message, and you can see that you can scroll down, so naturally you expect to be able to see the message … but no. Scrolling down merely offers you a Dismiss button. It’s similar when someone tags you in Facebook. The watch shows you’ve been tagged but doesn’t show you the post. Twitter likewise. It lets you know if several people you follow are all tweeting about the same topic, but you can’t actually see their tweets. Now, you could argue that this complaint is unreasonable. The watch is about quick glances, not interactions. And I do agree with that philosophy – I don’t want to be spending much time interacting with a tiny screen. But scrolling down in a FB message to see the actual message isn’t interaction, it’s exactly the type of short information delivery the watch is all about. I simply want to know if it’s something that requires an immediate response. Many apps have the right general idea – display bite-sized chunks of information, don’t ask you to interact with them – but too many of them direct you to your phone just one step too early. My second complaint is the flakiness of notifications in general. Some days they arrive reliably and promptly, within a second or two of the alert on the iPhone. Other days, they are delayed; other days, they simply don’t arrive at all from some apps. Case in point: I wanted to get a screengrab of a Facebook Message alert, asked a friend to send me one – which she did – and I got an alert on the phone but not on the watch. In principle, they should be sent to the watch when your phone is locked, and not otherwise, but the practice is far more random. This isn’t a massive deal given that my watch is simply a more convenient way to view notifications; I’m not actually going to miss anything as my phone will ping me. But it does make the watch less useful. 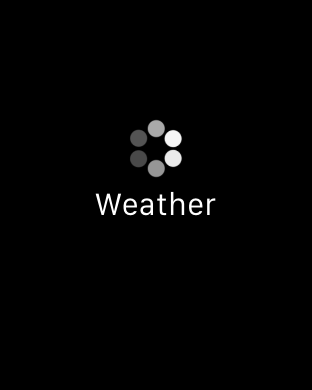 Update: Developer and 9to5Mac reader Kai Cherry seems to have explained this one: “In the case that an app takes ‘too long,’ WatchOS automatically ‘fails over’ to show the basic/default notification. This can happen if the Glance/Watch app has to do too much computation to figure out what to show. Third, Glances can be slow to open, even when at home on a fast broadband connection. The above screengrab is a sight that’s just a little too familiar. 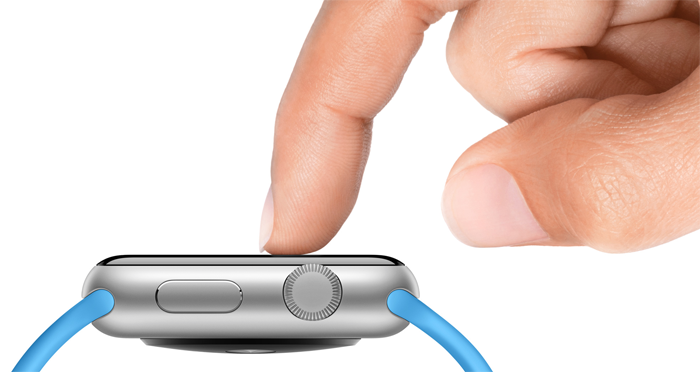 It’s most commonly seen when opening a Glance via a watch face complication. 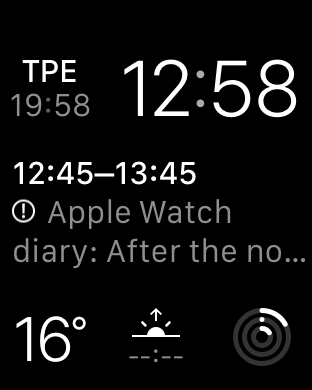 The above example was tapping the temperature on my Modular watch face to see the full weather. In that particular case, the progress screen sat there like that for a good ten seconds. That’s unusual, but waiting four or five seconds isn’t, and for a device that’s all about immediate access to info – and names the screens Glances to reinforce the point – even a four-second delay is way too long. Talking of tapping complications, most are tappable, to view more information, but not all – and there’s no obvious rationale behind it. Why does tapping the temperature open the weather Glance (albeit slowly) but tapping the sunset time doesn’t? It’s a pretty sure-fire bet that if you care about the sunset time it’s either because you’re planning to be outdoors then, and so care about the weather, or you want to take a sunset photo when, guess what, you care about the weather. My view is that all complications should be tappable, if for no better reason than that consistency is one of the keys to usability. Alongside my complaints, I should mention one former complaint I had that no longer applies. The update to Watch OS 1.0.1 may have broken heart-rate monitoring, but the promise that it would fix stand notifications has indeed been delivered. 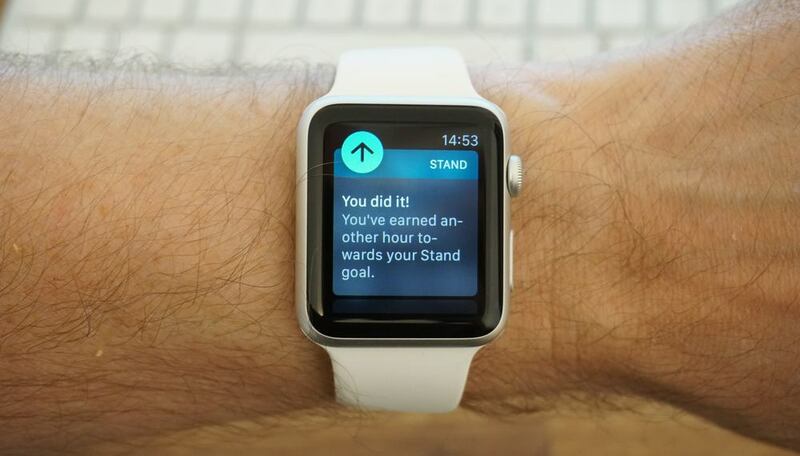 I’d initially found that it wasn’t recognising when I was already standing, and it now does, very reliably. On the subject of compliments, I love the digital crown for scrolling without covering content. So much so, there have been times I’ve wished I had one on my iPhone. So, a few more grumbles, but I’m still wearing the watch on a daily basis. Why so? A month in, I can’t really say it’s the cool gadget factor. I no longer view it as something new and interesting, and indeed am now slightly surprised when someone asks me about it. I forget that, for many people, it’s still newsworthy. For me, though, it’s something that has very much blended into my tech landscape, just like my Macs, iPhone and iPad. Useful, but not something I play with for its own sake. I haven’t, for example, found myself playing with different watch faces. I want as much info as possible viewable at a glance, so I’ve stuck solidly to the Modular face (albeit with minor rearrangement of the complications). I have occasionally gotten out of bed and wondered whether or not to bother putting on the watch, but I still have, every day. Not because it’s exciting; it isn’t. Not because it makes a significant difference to my life; it doesn’t. But it does make my life very slightly more convenient, and it does this a dozen or more times a day. And that, in the end, is why I’m still wearing it. How does it do that? Notifications top the list, despite my complaints about them. With spring having arrived in the UK in a big way, short-sleeved shirts are now the norm for me, so my issue with shirt sleeves has gone until the fall. The activity rings are surprisingly effective in encouraging a little more exercise in everyday life, taking the stairs a little more often, walking the long way around, that kind of thing. Having the outside temperature a glance away is handy given that I cycle everywhere, letting me know whether or not I need to take a sweater. Sunset time, too, is handy, when planning an evening cycle ride and wanting to be somewhere scenic for sunset. And there’s one other handy piece of functionality that I find myself using more often than expected. You can, I have discovered, use your Apple Watch to check the time.